I am schooled by Trina Robbins! 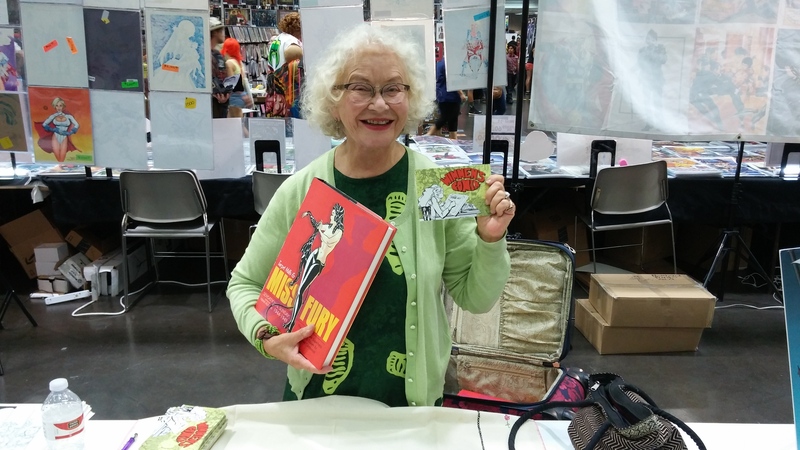 At Wizard Con in Sacramento, I met writer and HERstorian Trina Robbins again. I told her she ought to meet Valerie Estelle Frankel, who wrote that Empowered Wonder Woman book that I reviewed. I told Trina about Valerie mentioning in that book the fight where Wonder Woman and Cheetah rip each other’s clothes. And Trina said that Wonder Woman’s costume is super tough, and Cheetah is covereed in fur! She firmly asked me if I could think of any superheroines whose super-costumes get ripped. I said, um, maybe Supergirl in Crisis on Infinite Earths? And Trina met Valerie later, and said that Valeries said “Huh?” when she told Valerie about the ripping thing. I reread that part of Valerie’s book. Valerie said that Wonder Woman bends and twists to reveal as much skin as possible. No clothes being ripped off. I consider myself SCHOOLED! However, this could be a story idea for Super Holly Hansson, along the lines of the story that would-be writers send to Marvel again and again and again: Sabertooth and Wolverine meet in a forest, they fight, Wolverine wins. Holly would not do the bendy thing during a fight, she fights like a heavyweight boxer (and hits like one, too). Maybe Holly is in a forest in her street clothes, and then she meets a very annoying villain named The Ripper? I’ll think about it. Trina, thanks for a nice goofy idea. Another way to get short-fuse Holly mad. I bought a couple books from Trina. One was the Miss Fury book she is holding up, she edited it. Miss Fury beat Wonder Woman to the costumed heroine thing by six months. The art is fun, a panel of a big cross-dresser with lots of perfume-smelly lines sold me on it. This entry was posted in Uncategorized and tagged author, Cheetah, herstorian, Holly Hansson, Miss Fury, superheroine, supervillain, Trina Robbins, Valerie Estelle Frankel, Wizard Con, Wonder Woman, writer, writing by davemstrom. Bookmark the permalink.